The Rheims Bible (Catholic) is displayed in the left column. 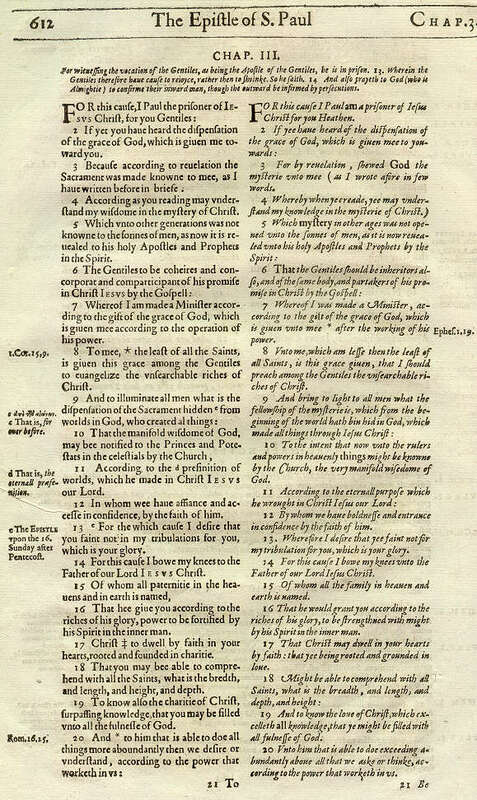 The Protestant Bishops' Bible is printed in italics in the right column. This makes verse-for-verse comparisons very easy. Even by looking at just one page, you can see the differences in translation between the two versions. Verse 9 is a hard verse to grasp, and the two versions each give a different take on its meaning. In Verse 3, as well as Verse 9, the Protestant version used the word "mystery" where the Catholic version translated the same word "Sacrament." The Rheims Bible did not re-translate words that were a part of Catholic dogma. In Verse 11, where the Protestants used the phrase "eternal purpose," the Catholics chose "prefinition of worlds" — which made no sense at all to non-Catholics.